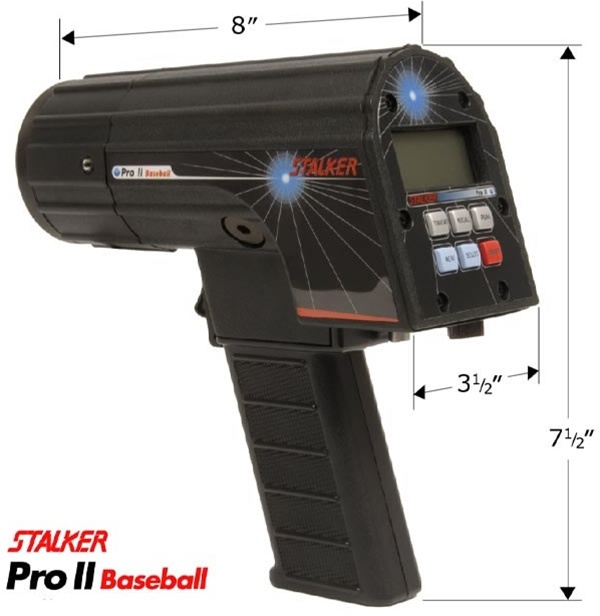 The Stalker Pro II is our top of the line radar gun, designed especially for our Professional Baseball customers. It tracks pitcher release speed, plate speed, batted ball speed, or all three speeds. 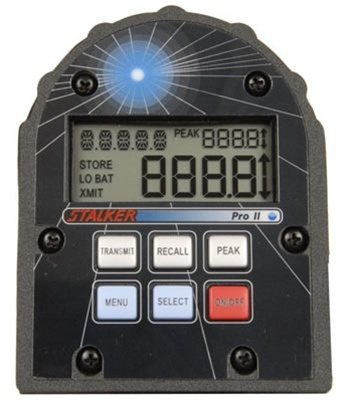 Stalker Radar engineers have drawn on the Stalker Sport's 15+ years of baseball scouting experience to develop new software and algorithms that yield greater range, sensitivity, and accuracy. From the rugged cast-metal exterior, to the world’s most sensitive transmitter/receiver, to the miniaturized and modernized electronics, to the direction sensing software, and the baseball-specific algorithms, the Pro II is a new-generation sports radar in a class by itself. Its 10-milliwatt transmitter, ultra-sensitive balanced mixer receiver, and its sophisticated digital signal processing algorithms enable baseball speed measurement up to 300 feet. No other sport radar can claim as much distance. Its 10-millisecond acquisition time is the best on the field and leaves other baseball radars in the dugout. The four-step sensitivity settings allow the user to adjust the Pro II for any situation. To verify accuracy during development, Stalker engineers used a commercial ballistic chronograph to precisely measure pitcher release speeds. They tested the Pro II against the industry standard Stalker Sport and Stalker PRO models, the second-generation Sport 2 and Solo 2, as well as competing radar products. While testing, engineers found that all Stalker products measured ball speed consistently, but there was a big difference between us and them. They found that the other baseball gun reads release speeds from 1-3mph up to 5mph faster than the actual release speed. Why compare apples to oranges? Choose any Stalker Radar, and it’s always apples-to-apples. Naturally, the Pro II displays speeds in MPH or KM/H, in whole units or tenths. And the Pro II is actually waterproof to a depth of 2 feet. Caught in a spring training shower? No worries. 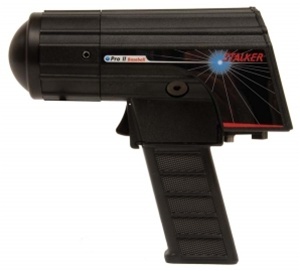 The 34.7 GHz Ka-Band Doppler radar is powered by a rechargable 7.2-volt lithium-ion battery handle capable of powering over 2+ hours of nominal use. Both the Liquid Crystal Display and the six snap-action buttons are backlit to allow use in any lighting condition. Specifically designed to measure pitching speed and time base runners, the Pro II’s new direction-sensing capability enables it to measure the speed of the batted ball. The two speed windows and 5-digit status window display speeds and other information in a straight-forward, easy-to-understand format. 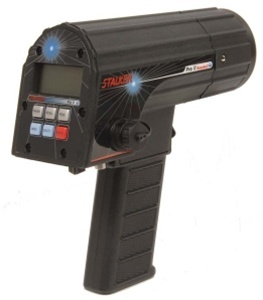 A speed range of 5-150 MPH with a user-selectable low-speed cutoff allows the user to exclude other moving objects that might interfere with baseball speed readings. Low battery indicator, 1200-to-38.4k baud serial interface, Stopwatch Mode (with optional cable), and the choice between whole units or tenths put the Pro II at the top of the order.